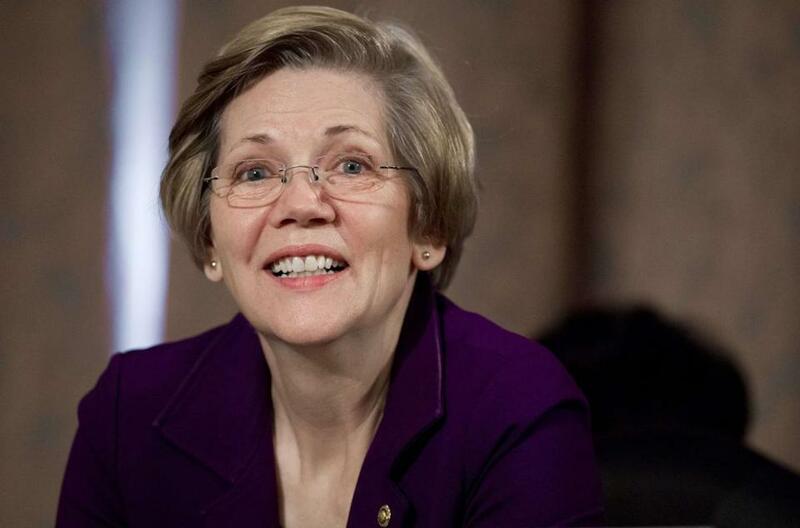 US Senator Elizabeth Warren blasted government profits on student loans in a speech at Suffolk University’s Law School on Saturday, firing up a crowd of law students, education researchers, and financial specialists. Warren’s speech, peppered with the familiar battle cries that buoyed her election campaign, outlined policy changes she has long sought on student lending, a signature issue for the first-term senator. Still, for many in attendance Saturday, Warren’s presence was significant. To them, she is a long-awaited ally in the halls of power and the articulate public face of a reinvigorated effort to reduce ballooning college loan debt. “She presents it in a way that it’s hard to imagine anyone wouldn’t be supportive of what she’s proposing,” said Suffolk’s president, James McCarthy. Warren drew applause as she called for an end to government profits on student loan interest, the reinstatement of bankruptcy protections for student borrowers, and penalties for colleges whose students default on their loans in large numbers. Last summer, Warren defied her party and voted against a compromise bill that lowered interest rates on new subsidized federal loans, saying it would allow interest rates to rise and leave the government holding profits earned on the backs of student borrowers. But in brief comments to a reporter following her speech, Warren framed that bill’s passage as an encouraging sign of bipartisan support for lowering interest rates — this time, she hopes, on existing student loans. “Congress agreed overwhelmingly that any interest rate above 3.8 percent was too high, so this Congress should not have difficulty with the same view on past loans,” she said. Saturday, Warren again displayed her willingness to be a fly in the Democratic ointment, denouncing a provision in the White House’s proposed 2015 budget that would cap forgiveness of federal loans for college students who go on to work in the public sector. Currently, graduates who work full time in public service can have the remainder of their federal loans forgiven after making 120 monthly payments, which usually takes 10 years. President Obama’s administration has argued the cap is needed to prevent colleges from raising tuition, since students who plan public service careers are content to take on more debt, knowing they will never be required to repay the full amount. McCarthy lauded Warren’s remarks, saying Suffolk has taken steps to control costs and even saying he would welcome legislation that holds schools partly responsible if its graduates default on loans. Warren’s populist tough talk on student loans, especially her proposals for debt relief and refinancing, has contributed to her popularity among a younger generation that is increasingly saddled with debt: According to the Consumer Financial Protection Bureau, US college graduates owe a total of around $1.2 trillion, while the average debt for a 2012 graduate with a bachelor’s degree is $29,400, according to the Project on Student Debt. And Warren’s argument that the overall debt burden on graduates has become an anchor on the country’s economy is gaining credence in broader circles, as figures show a continued decline in first-time home ownership and auto loans among the young, for example. Warren is not without critics. Some experts dispute her claim that the government profits off student loans. Others argue student loans are among the riskiest investments the federal government makes, saying high interest are justified by high default rates. But momentum may be on Warren’s side, said Anne Johnson, the executive director of Generation Progress, a project of liberal think tank Center for American Progress. Far from being an abstract issue, student loans are a concrete reality for graduates.